Nixle | Ashland Is Ready | CERT | Smokewise | Ready Set Go! 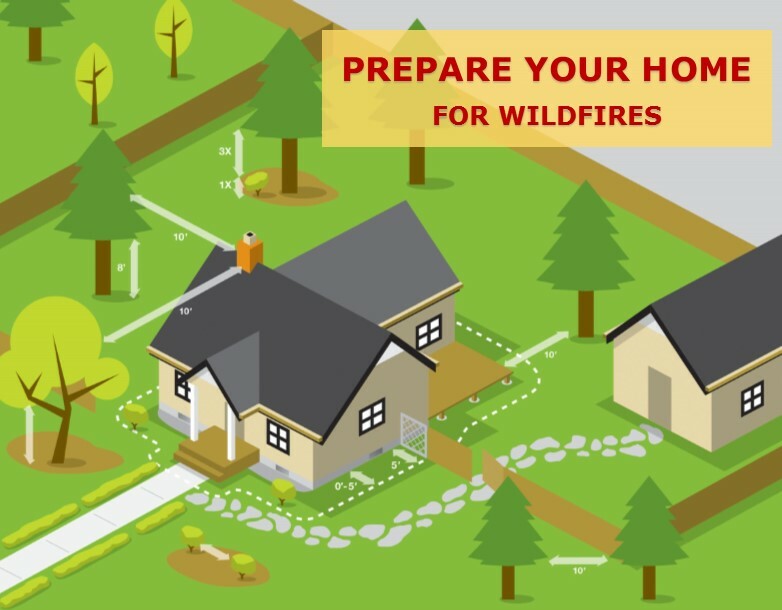 Ashland FireWise provides property owners and residents with simple and direct steps to help reduce a home’s wildfire risk by preparing your home and property before wildfire strikes. Limiting the amount of flammable vegetation, choosing fire-resistant building materials and construction techniques, along with periodic exterior maintenance in the three home ignition zones - increases the chances your home will survive a wildfire when exposed to embers and/or surface fire. Visit www.nfpa.org for more details on the Home Ignition Zones. Experiments, models and post-fire studies have shown homes ignite due to the condition of the home, and everything around it, up to 200 feet from the foundation. EMBERS: Burning pieces of airborne wood and/or vegetation that can be carried more than a mile through the wind. They can cause spot fires, ignite homes, debris and other objects. Embers can penetrate and smolder in woodpiles, patio/deck items, vents, roofs and debris filled gutters. SURFACE FIRES: These can be low or high intensity fires that burn through live or dead grass, ground debris, and small trees and shrubs. They can ignite houses and attachments like fences, decks and porches. CROWN FIRES: This extreme type of wildfire burns in the tops of trees and spreads by radiation and convection and are heavily influenced by wind. Crown fires generate embers that can travel more than a mile and create spot fires beyond the main fire. around your home and property? Call (541) 552-2246 to schedule your Firewise Assessment! During a wildfire, airborne embers are a major cause of home ignitions. It is extremely important that these embers do not find a place to land where they can ignite your home. THE ROOF: Keep roofs clean from leaf litter and pine needles. Litter in gutters or roof valleys, and bird or rodent nests under tiles on the roof are common causes of embers igniting a house. Remove all tree limbs within 10 feet of chimneys, or that overhang the roof. Conifer and cypress branches should be pruned to a minimum distance of 10 feet from any point of a structure. ROOFING MATERIALS: Replace wood shake roofs with Class B or Class A roofing materials. Types of Class A fire-rated roofing products offer the best protection (i.e. Composite shingles, metal, cement tile and clay). Inspect shingles/tiles and replace or repair any that are loose or missing to prevent ember penetration. If gaps exist between the roof covering and the roof deck at the eave or ridge, fill the space with a "bird stop" material. GUTTERS: Metal roof gutters do not ignite, only the debris material that accumulates in them. Vinyl roof gutters can ignite when the debris material is ignited and flaming gutters can fall from the roof edge and land next to the house, which is why the first 0-5 feet (Immediate zone) needs to be clear of flammable materials. FIREPLACE CHIMNEYS: Remove all tree limbs within 10 feet of the chimney, or that overhang the roof. Remove debris that may accumulate at roof-to-wall intersections. Install a spark arrestor if not already present. When wildfires are approaching, close the damper, fireplace screens and glass doors. SCREENS: Check all exterior vents along the eaves, walls, and foundation to make sure the screening is intact. Roof, attic and crawlspace vents should be screened with 1/8-inch metal mesh screening to prevent ember entry. WINDOWS: Windows are one of the weakest parts of a home in a fire, usually breaking before the house ignites. Trim vegetation away from windows. Burning vegetation close to a window can break glass, allowing fire to enter. Repair or replace damaged or loose window screens and any broken windows. Multi-paned tempered glass can help reduce the risk of fracture or breaking in a wildfire. Closable, solid exterior shutters can provide extra window protection. Keep roof skylights free of debris. If your roof is steeply pitched, consider using flat, double-paned glass instead of a domed skylight. Glass is a better option than plastic or fiberglass. WALLS AND ATTACHMENTS: Perform regular maintenance to prevent accumulations of dead and dry vegetation around hose reels, planters or other wall attachments. Wood-product exterior siding is combustible; make sure it is in good condition. Seal gaps and crevices. Examine the siding for locations where embers could accumulate or lodge and apply caulking at trim-to-siding locations where it is missing or has failed. Use ignition-resistant building materials on exterior walls whenever possible (i.e. masonry products, stucco, plaster and cement). DECKS AND ELEVATED PORCHES: Never store flammable materials underneath elevated decks/porches. Remove dead vegetation and debris from under decks/porches, and between deck board joints. Place 1/8-inch metal mesh screening between low-profile decks from surface to ground, to block embers from collecting underneath. FENCING: Wooden fences can carry flames directly to the house. Use non-flammable fencing material (metal or masonry) when attaching directly to the siding. Ensure there's a minimum of at least 5-feet of noncombustible material where it attaches to the siding. Do not add vines or other types of vegetation to fencing material. NOOKS AND CRANNIES AND OTHER SMALL SPACES: Stay aware of small spaces like around A/C units, hot tubs and garden sheds, or along up-slope sides of structures that may collect dry vegetation debris. Keep clean and clear of debris throughout fire season. Weather seal the perimeter of garage doors/basement doors to help keep embers out. Be sure doors are tight fitting, so embers can’t slide under the door or in from the sides. Close and protect pet doors when wildfires are approaching to prevent embers from gaining access to the home. Create a "fuel-free" zone within 5 feet of any structure, including decks. Clear away all bark mulch and trim back vegetation, especially where house siding comes down to ground level. Tip: Move any flammable material away from wall exteriors a minimum of 5 feet – Bark mulch, flammable plants, leaves and needles, combustible storage, firewood piles – anything that can burn. Never store flammable materials underneath elevated decks/porches. Bark mulch products should be replaced with non-combustible products such as crushed stone/gravel options, mineral soils or bare dirt. Dead Vegetation, dried leaves, pine needles and ground debris accumulations should be frequently removed from this area. Hardscaping features (e.g. stone, gravel, concrete) should be installed around the perimeter of the home whenever possible, to help keep the ground free of vegetation, ground litter and debris. ​Remove trees and shrubs from this area; or replace with succulents. Trim away deciduous tree limbs that overhang from the Intermediate zone into this area. Keep conifer and cypress branches a minimum of 10 feet away from all structures. Grasses and weeds should be cut to four (4) inches or less to prevent fire from spreading. Ashland Municipal Code requires this to be done by June 15th of each year, and to maintain those heights throughout fire season (AMC9.04). Water plants, trees and lawns to keep them from becoming dry. Thin trees and shrubs to prevent interlocking canopies. Space trees at least 10 feet apart at branch tips, more if on a slope. Conifers are more flammable than deciduous trees. Select only "Fire-safe" landscape plants when planting in this zone (See our FireWise Plant List). Remove ladder fuels (vegetation under trees) so a surface fire cannot reach the crowns. The lowest limbs of trees should clear vegetation underneath the tree by three times (3x) the height of the undergrowth. Remove lower branches on trees and shrubs to prevent fire on the ground from moving up into the crowns. A good rule of thumb is to prune to a minimum height of eight (8) feet on larger trees and 1/3 of the tree height on small trees. Trim trees so foliage is no closer than 10 feet from the outlet of any chimney, roof line, eave, or wall. Remove all cut vegetation, dead material, and debris from the property. This includes leaves and pine needles. Use flower beds, walkways, rock walls, and watered lawns to break up the continuity of vegetation in this zone. Thin understory brush, especially under the canopy of any trees. If there are no trees, thin around the largest species of brush and prune away lower limbs and dead wood. Dispose of heavy accumulations of ground litter and debris. Prune lower limbs on all trees as suggested in the section above. Highly combustible trees and shrubbery should be spaced to prevent interlocking canopies at maturity. Consult with an arborist or forester if you are unsure which species are best for your property. All dead vegetation should be removed. Islands of more dense trees or brush can be left if isolated from surrounding vegetation. Thin brush and limb trees within 30 feet of your driveway on each side, especially if it is more than 100 feet long. Increase the distance on the downhill side if the driveway crosses a slope. Establish and maintain at least 13.5 feet of clearance above the road surface for fire vehicles to pass under tree limbs.